Add the flour, cocoa, salt, cinnamon and the bicarbonate of soda in a bowl. Add the sugar and mix. Mix again with some melted butter. In another bowl mix some wine and a yolk. Add it to the mixture. Make the dough then leave it in the fridge in the bowl for half an hour with foil on the top. Cut some not really big squares of the dough after displacement. Roll it on cannoli special forms, or if you don’t have just make some from cylindrical shaped aluminum foil, or something circled. 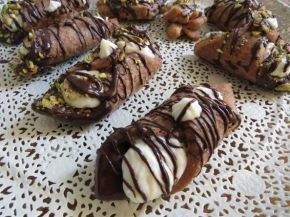 You can deep fry them with the cannoli forms, but if you don’t have forms just put the cannoli in the freezer for an hour, then remove the shape and deep fry. They are done when get golden brown. To make the cream just mix the cheeses with the sugar. 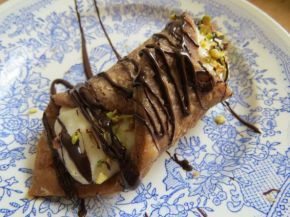 Richly fill the cannoli. Add some pistachios and melted chocolate. Enjoy!